Here is another interesting case I thought you might like to see. This lady first came to see me a little under two years ago. She is 42 years of age and wanted my opinion on her smile. She was always embarrassed about her teeth, wouldn’t smile in photos & would tend to cover her mouth with her hand when meeting people socially. The funny thing about this particular case was that this lady was a regular attender of the dentist and actually enjoyed having her teeth “checked and cleaned”. The problem was that she was so embarrassed about her smile, that she actually never mentioned it to her previous dentist (…and he never raised the issue with her either). It had gotten to the stage where she was so self-conscious of her smile that she has finally decided enough-is-enough… time to do something about it. And here she is in my chair today. Take a look at the picture above, taken during her first visit. We can understand why she isn’t happy. So, after discussing various options, myself and my patient are agreed that the best course of action is to undergo a course of braces to straighten her teeth up, followed by some teeth whitening to brighten things up, finishing with some restorative dentistry to improve the shapes and appearance of her teeth. For the first phase of treatment, I’ve asked one of my orthodontist colleagues to improve the patient’s bite and reposition the teeth for me. This phase took about 16 months to complete. No shortcuts here I’m afraid. 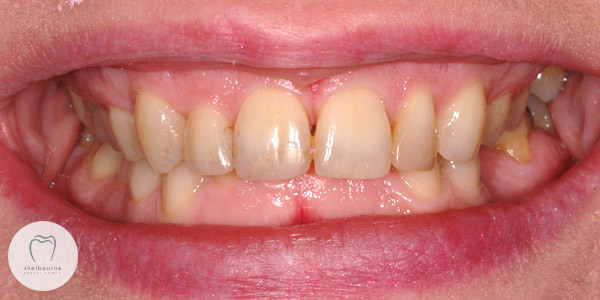 The second phase of treatment focuses on improving the shape & colour of the teeth. To begin I carry out a course of teeth whitening for her. Once we are happy with the whiter teeth, I then do some cosmetic bondings on the upper front six teeth to improve the shape and appearance. Are you unhappy with your teeth? Embarrassed about your smile? Please let us help you! If you’re looking for a dentist in Dublin, we’re always happy to accept new patients. You can book an appointment online or call our reception team at 01-6655900. And as always, you can email us at info@shelbourneclinic.ie – during office hours we always aim to respond to queries within 30 minutes.